Ba Na Hills is one of the most beautiful Danang attractions which attracts a lot of domestic and foreign tourists from all over the world. This is a mountaintop resort complex which looks like a medieval castle. However, it is not as ancient as the outside appearance. Inside these stone walls, there are accommodations with modern designs, world-class restaurants and a lot of exciting things that will surprise you. 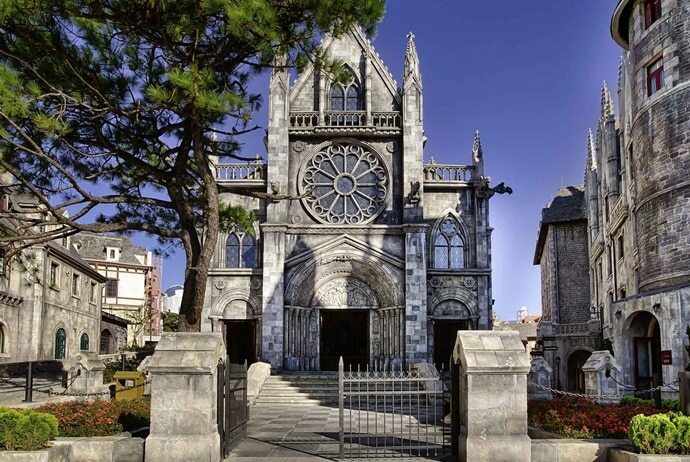 Probably upon planning your trip to Ba Na Hills, you will have a lot of questions. However, don’t worry, the information and tips we present below will address all your concerns, so you can have the best preparation before commencing your trip. What Is The Best Time To Visit Ba Na Hills? The period from April to August every year is the best time to visit Ba Na Hills. During this period, the weather is extremely ideal for sightseeing and having fun. Especially, Ba Na Hills has four times that the temperature changes during the day. This weather is rather similar to the North of Vietnam, in which there are four seasons in a year. In the early morning, you will experience the spring-like weather. The cool breeze gently blows through the early morning’s fog, giving you a feeling of comfort. At noon, the sun begins to shine, making the weather at this time be like summer. Although there is plenty of sunshine, the weather is still cool, so it is suitable for leisure activities in Ba Na Hills. The afternoon lasts from 3 pm to 6 pm. Although this duration is a little bit short, it is still similar to the cool weather of autumn. After about 6 pm, the weather is cold, giving you a sense of living in winter. The climate is quite cold at this time; therefore, if you want to go out for a walk, wear warm clothing to stay healthy. If you like a quiet space to avoid the crowds, you can visit Ba Na Hills on weekdays or in winter. Besides, if you want to save money for your trip, you should visit Ba Na Hills from November to January annually. At this time, the number of tourists is lower than in other months. As a result, the price of services is also quite cheap. It is noteworthy that the period from November to January is winter, so the weather in Ba Na Hills is quite cold. If you are going to travel with the elderly or children, you ought to consider the most appropriate departure time for your trip. How To Get To Ba Na Hills? Located about 30km southwest of Danang, Ba Na Hills is known as the “jewel of the city”. With its cool year-round climate and wild mountainous scenery, Ba Na Hills is well suited for vacations that are ideal for relaxing and exploring. There are many vehicles to go from the center of Danang to Ba Na Hills, such as motorbike, taxi or car service. Riding a motorcycle is reckoned as the most economical way to get to Ba Na Hills. It is also easy for you to move to anywhere without depending on anyone. You can rent a motorbike from 8 am to 9 pm at motels or hotels with the prices ranging from 100.000VND to 150.000VND per day (depending on the type of motorbike). If you travel with friends or children and the elderly, it is best to go by taxi. However, its prices are somehow high, so consider the cost factor before using this vehicle. If you go in groups and do not know the way to go, you should choose this vehicle to move during your trip to Ba Na Hills. 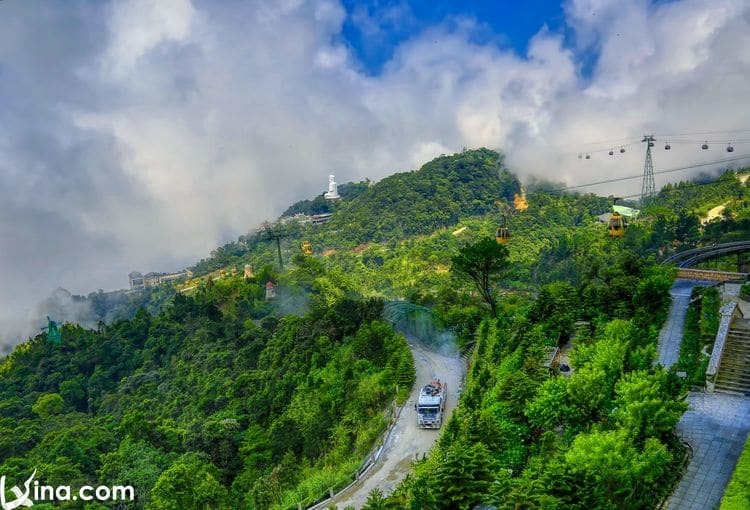 Where To Buy Cable Car Tickets In Ba Na Hills? When you arrive at the cable car station, you need to buy tickets to get to the top of Ba Na Hills at the ticket counter located at the base of the mountain. However, at the weekend or during the tourist season, you will have to queue for a long time to buy tickets, so a tip for you is buying cable tickets in advance at some reputable travel companies. The ticket is only available during the day and will not be able to use the next day. Local people need to bring ID card or birth certificate to get discounts. When traveling by cable car, do not smoke or eat in the cabin; avoid opening the cabin door or leaning out. 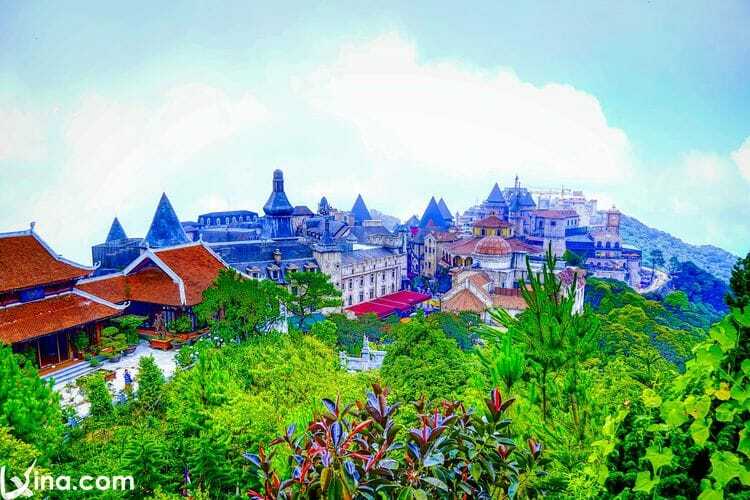 If you decide to stay overnight in Ba Na Hills to take part in camp activities, play folk games, and see the sunrise, you had better take some tips below about hotels in Ba Na Hills. These will help you make the right decision because the price of hotels in Ba Na is relatively high. This is a 3-star standard hotel in Ba Na Hills. Morin Hotel is designed in a French architectural style. It is a complex model of the bar – restaurant – hotel. The price of rooms in this hotel rates ranges from 1.000.000 to 1.200.000 VND / night. Located at Debay Station, Debay Hotel is a fairly quiet place. There are also outdoor restaurants, souvenir shops, D’hiver bar, and services for laundry, airport pickup, car rental, and campfire. The rates of rooms in this hotel range from 1.100.000 to 1.600.000 VND / night. French Village Hotel owns 484 rooms of 4-star standard, 19 food and beverage outlets, 20 retail outlets, bar, cafe lobby, bakery, a spa – gym and an indoor swimming pool that cover the area of 443m2. Especially, the room in this hotel is designed and equipped with all useful facilities. However, the service price in this hotel is quite high, especially food service in the evening. The room rate in this hotel depends on the tourist season. 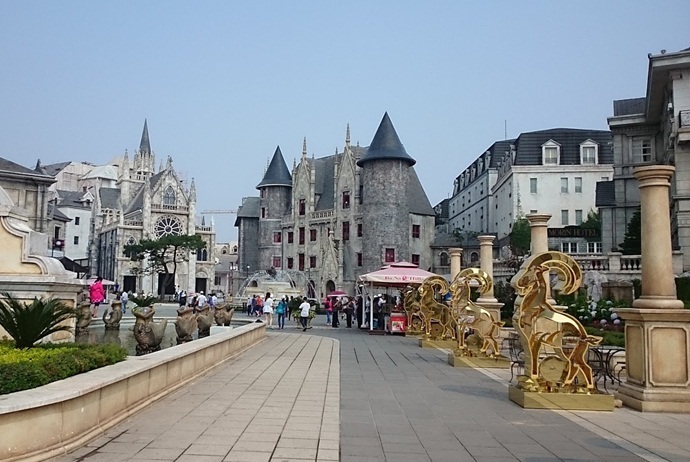 What Are Attractions In Ba Na Hills? From the height of more than 1000 meters, when the cable car gets to the top of the mountain, you can see the vast space of Ba Na. It looks like a perfect painting with clouds, mountains, and waterfalls. After that, when it reaches a certain height, in favorable weather, the cable car goes through the clouds. You will feel like flying into the wonderland. 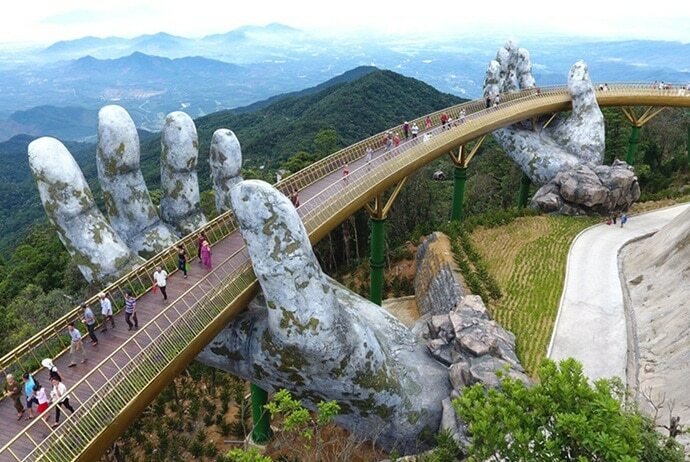 Newly opened in June 2018, this gold bridge can be seen as a highlight in Ba Na Hills with a length of nearly 150m. It is supported by giant hands, allowing tourists to easily move from the base of the mountain or French village to the Le Jardin D’Amour flower garden. Located at an altitude of 1414 meters above the sea level, the Golden Bridge’s design is extremely impressive, drawing a fascinating arc midway through the sky. The meaning of this bridge is that the mountain gods are helping people to easily get to the flower garden, instead of going through the forest and streams. You definitely should not miss this great site. Linh Ung Pagoda is a sacred temple that you must visit during your trip to Ba Na Hills. It is located at an altitude of nearly 1,500m above the sea level. When there is not much cloud, if you stand from the gate of the pagoda, you will see the majestic panorama of Ba Na Mountain (Núi Bà Nà). On the side of the temple, there is a statue of Sakyamuni Buddha, the founder of Buddhism, with a height of 27m. The statue is carved extremely finely with eight reliefs that reflect the life of ShakyamuniBuddha. From Debay Station, before visiting the Debay Wine Cellars, Le Jardin D’amour Gardens and Linh Ung Pagoda, you will have a short trip on the train of the Garaventa (Switzerland). The train is able to accommodate 80 people / cabin, moves through over 400m of the cable length, and reaches the speed of 5m / s and the operation of 1600 passengers/hour. Operating time: 8 am – 4h45 pm. Each trip is 15 minutes apart. Service time: 8 am – 6 pm. Ticket price: Currently, cable car tickets include train tickets. So you do not need to pay any extra costs. Tickets are valid during the day. This is definitely a place that girls love so much. There are 9 gardens with all kinds of flowers and themes, including Suoi Mo Garden (Vườn Suối Mơ), Ky Uc Garden (Vườn Ký Ức), Than Thoai Garden (Vườn Thần Thoại), Dia Dang Garden (Vườn Địa Đàng), Thieng Garden (Vườn Thiêng), Grapefruit Garden (Vườn Nho), Uyen Uong Garden (Vườn Uyên Ương), Suy Tuong Garden (Vườn Suy Tưởng), and Secret Garden (Khu Vườn Bí Ẩn). Each garden has its own beauty for you to explore. This is the temple of the Ba Chua Thuong Ngan (Bà Chúa Thượng Ngàn), who protects the entire area of Ba Na. in addition to conquering the highest peak of Danang city (1487m), tourists visiting this temple also feel the spirit of relaxation, and all sorrow is removed. From here, you can admire the clouds, sky, and mountains of Ba Na which are immense but very romantic. This is the most beautiful scenic spot in Ba Na Hills that impresses nature-loving tourists. Visiting Wine Cellar, visitors will be able to see the equipment as well as wine created by the French in 1923. Currently, it displays only symbolic objects. If you want to enjoy a glass of fine French wine, go to the wine bar. It has many kinds of wine for you to choose from. Apart from enjoying stunning beauty of nature in Ba Na Hills, you can also experience cavernous terror in the eye blink at Drop Tower, which is the wildest ride at Ba Na Hills. From the top, riders will be able to look out the glass dome to see the sky outside as far as the clouds allow. After that, you will be suddenly dropped from the height of 29 meters into a cave based on the two Jules Verne novels, namely Journey to the Centre of the Earth (created in 1864) and Twenty Thousand Leagues Under the Sea (created in 1870). Fantasy Park which offers about 105 free games ranging from gentle and relaxing to thrill and adventure will definitely attract you. When playing at Fantasy Park, you just have to pay extra fee if you enter the Room of the Wax statue (100.000 VND / adult or child above 1.3m, free with children under 1.3m). In addition to 90 games in Fantasy Park, you will be fascinated by the incredibly attractive and adventurous tub rides. The game is only for adults and people who are in good health. This is an interesting and creepy place. If you are wondering how some of the celebrities in the world look like, then do not skip visiting the Ba Na Hills Wax Museum. Here, you will see some rigid approximations. Carnival takes place from April to September in Du Dome, France Village. You can enjoy a 30-course buffet lunch at Morin Restaurant for 180.000VND / adult and 90.000VND / child. Or you can eat at Mercure Danang French Village Ba Na Hills. The buffet price here is 200.000VND / person. Hoi An (Hội An) Restaurant: Serves local dishes like noodles, rice noodles, and rice. Doumer Restaurant: Serves fast food, fruit, and soft drinks. The Du Dôme Beer Restaurant: Serves dishes such as buffalo meat, stork meat, BBQ party, German and Hanoi fresh beer. Kavkaz Restaurant: Serves typical Kavkaz (Russia) dishes such as grilled ribs, grilled lamb, and Russian salad. Buffet Club Restaurant: Serves multi-flavor buffet with 68 dishes (180.000VND / person). Buffet Vista Restaurant (Russia): Serves typical cuisine of the Caucasus region (Russia) (250.000VND / person). Brasserie Restaurant (B8): Serves Italian cuisine. La Crique& Café Postal Restaurant: Serves European buffet (250.000VND / person). L’Etable Restaurant: Serves traditional Vietnamese and Asian traditional dishes. If you want to save money, you should bring your own food and eat at the restroom or the play area. The above is our tips that hopefully help you have a fun and most economical trip. Wish you have a wonderful experience at Ba Na Hills!